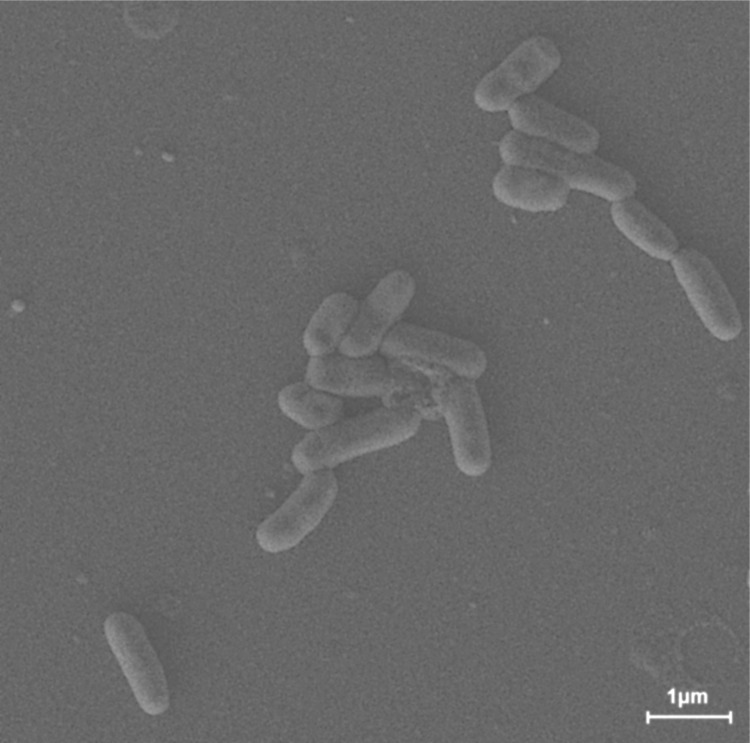 The strain M1-8T (= KACC 21127T = JCM 16362T) is the type strain of the species Leucobacter salsicius , which was isolated from a Korean salt-fermented seafood known as “jeotgal” in Korean. The species epithet was derived from the Latin word salsicius, which means salty . The genus Leucobacter was proposed in 1996  and comprises a group of related Gram-positive, aerobic, non-motile, rod-shaped bacteria. Leucobacter strains have been recovered from a variety of ecological niches, including activated sludge from soil , wastewater [4-6], river sediments containing chromium , nematodes [7,8], food [1,9], potato plant phyllosphere , chironomid egg masses , air , soil , and feces . 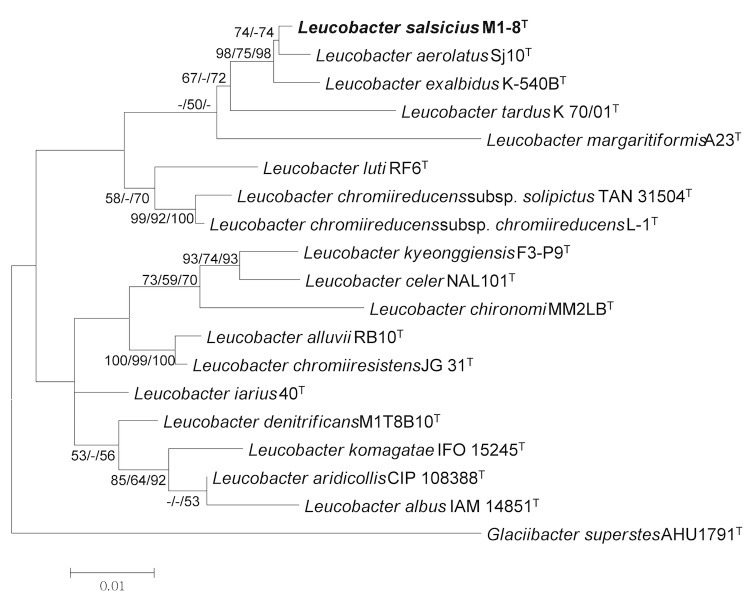 Several Leucobacter strains have been reported to possess chromate resistance [1,4,11]. 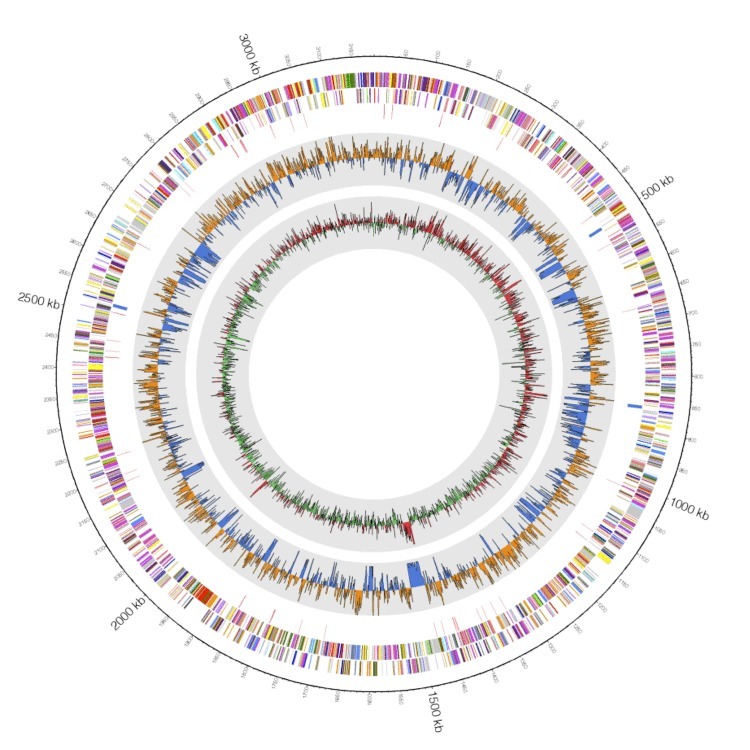 At present, there are 18 validly named Leucobacter species, but the only sequenced genomes in this genus were Leucobacter sp. UCD-THU  and L. chromiiresistens . Among them, the highest resistance to chromate (up to 300 mM K2CrO4) was observed in L. chromiiresistens, in vivo . However, no information has been generated on genes related to the mechanism of chromate resistance . Strain M1-8T is classified as class Actinobacteria, order Actinomycetales, family Microbacteriaceae, genus Leucobacter (Table 1) . The strain L. salsicius M1-8T was isolated from a Korean salt-fermented food that contains tiny shrimp (shrimp jeotgal). The cells of strain M1-8T were rod-shaped, 1.0–1.5 μm in length, and 0.4–0.5 μm in diameter (Figure 2). No flagella were observed. The colonies were cream in color and circular with entire margins on marine agar medium. Strain M1-8T was aerobic and Gram-positive (Table 1). Optimum growth was observed at 25–30°C, at pH 7.0–8.0, and in the presence of 0–4% (w/v) NaCl. The tolerance of Cr (VI) was observed at up to 10.0 mM K2CrO4. The physiological characteristics, such as the growth substrates of M1-8T, were described in detail in a previous study . Scanning electron micrograph of Leucobacter salsicius M1-8T, which was obtained using a SUPRA VP55 (Carl Zeiss) at an operating voltage of 15 kV. The scale bar represents 1 μm. The peptidoglycan hydrolysate from strain M1-8T contained alanine, 2,4-diaminobutyric acid (DAB), γ-aminobutyric acid (GABA), glutamic acid, and glycine. The predominant fatty acids (>10% of the total) in M1-8T were anteiso-C15:0 (63.6%), anteiso- C17:0 (16.7%), and iso-C16:0 (14.2%). The polar lipid profile of strain M1-8T contained diphosphatidylglycerol and an unknown glycolipid. The major menaquinone in M1-8T was MK-11 and the minor menaquinones were MK-10 and MK-7.